A luxury sports car maker based in the Netherlands has announced it is moving an assembly plant to Coventry. 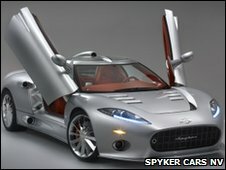 Spyker Cars makes up to 50 luxury cars a year, mainly for the US market, with prices starting from about £180,000. It said up to 45 out of 135 jobs would be at risk when it moved its assembly plant from Zeewolde to Whitley, in Coventry, by the end of 2009. It said the move would reduce operating costs as it would be closer to its main parts supplier CPP Manufacturing Ltd.
Spyker Cars said its headquarters would remain in Holland. Coventry was home to Jaguar car production in Browns Lane until it moved its plant to Castle Bromwich in 2005. Its engineering site is still based in Whitley. Peugeot also had a car plant based in Ryton, near Coventry, which shut in 2007. The city is currently home to Modec, electric car makers and London Taxis International, which makes the traditional black cab. Victor Muller, Spyker Cars chief executive, said: "With approximately half of our vehicles' parts and components sourced in the UK, and virtually all key suppliers being located there, moving closer to our suppliers and engineering partners will result in substantial savings and tangible efficiency improvements. "We realise that jobs will be affected in the Netherlands but we believe this move is necessary under the current economic circumstances and is in the best interest of the company and all of its stakeholders." The Society of Motor Manufactures and Traders chief executive Paul Everitt welcomed the move and said: "Investment in UK automotive facilities is good news for the industry."